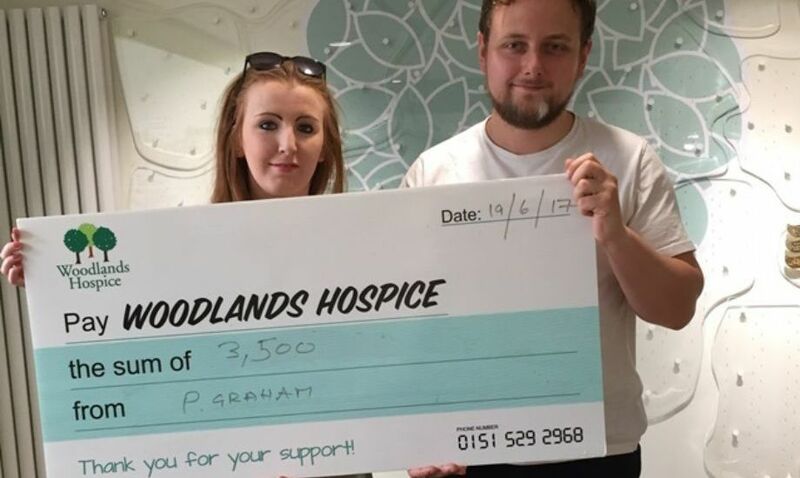 It was lovely to meet Paul Graham and his partner Rebecca Farley when they visited Woodlands Hospice recently to present us with the proceeds of a musical tribute night in memory of Paul’s Dad David Graham who had been cared for at the Hospice. The event which took place on 19th May at the Old Swan Conservative Club was a sell-out and a fitting way to remember an inspirational musical gentleman and raised an incredible £3,500. Paul and Rebecca during their visit when they presented their cheque for £3,500 to Woodlands Hospice. David had been a keen musician and used to perform with his band ‘New Image’. In a very fitting tribute the group reformed, with son Paul taking over lead vocals for the night with other band members including Thomas McManus, Stan Metcalfe, Charlie Newport and Niall Williams. Dave’s long term band mate Kenny Farrel also performed with guests John, Jan, Wendy & Lyn Mitchel. On the night Paul’s group the Dockers also played. Christine Peach, Corporate & Community Fundraising Manager at Woodlands said: “Many thanks to everyone who supported this fabulous event and well done to Paul and Rebecca and all those who helped make the night such a success”. If you would like to hold a fundraising event for Woodlands Hospice please contact Christine Peach or Kay Frame on 0151 529 8117.